Rice is my heart and soul. This double-lid donabe rice cooker, "Kamado-san", makes the premium quality rice and make my life so happy always. 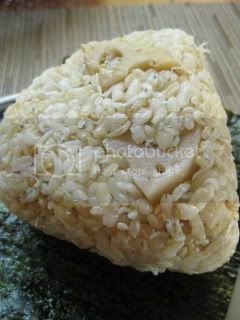 I made onigiri (rice balls) again with donabe rice. It's lotus root and steamed shirasu (baby white fish) rice, with a little kick of yuzu kosho (yuzu citrus and hot pepper paste). I sauteed the lotus root slices, seasoned with some soy sauce and yuzu-kosho, then tossed with shirasu fish. The mixture was added to the freshly made donabe brown rice and tossed. It smelled so wonderful! 1. Cook the plain brown rice. 2. Peel the lotus root (about 3 oz), and slice thinly. Cut further into quarters. Soak in water for 15 minutes. Drain. 2. Saute the sliced lotus root in 1/2T olive oil. Add 1T sake and 1.5T light color soy sauce ("usukuchi shoyu"). Cover and steam-fry for about 5 minutes. 3. Add shirasu (baby fish - about 3 oz) and 1 teaspoon yuzu kosho paste. Add 1 tablespoon white sesame seeds. Stir well. 4. Remove the pan from the heat. 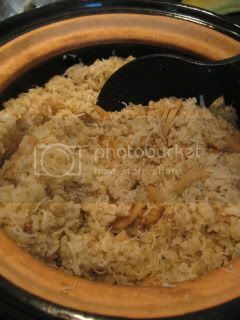 As soon as the rice is ready, add the mixture to the rice. Toss well. 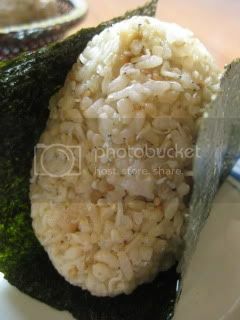 Make the mixed rice into onigiri (rice balls) and wrap with nori.